Retro inspired finished to the highest standard for comfort and style. The Dirty Dog Boom has a tortoise frame and a brown polarised lens. 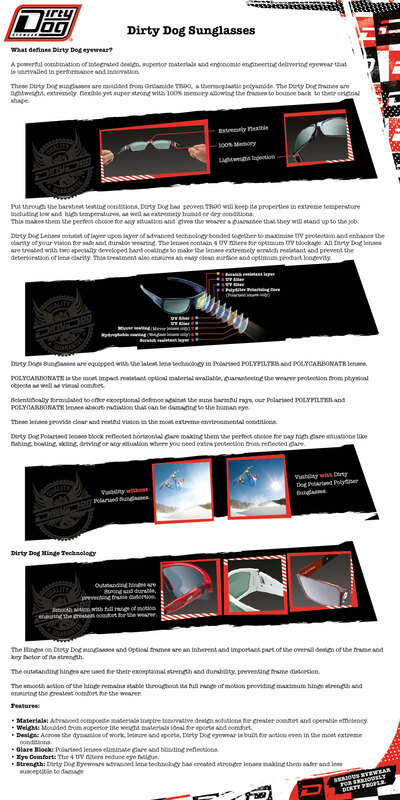 Dirty Dog Eyewear draws upon an active engagement in the world of sports for inspiration. Function drives our design. The aesthetic is based on concrete wearability, comfort, lightness and responsiveness to the demands of daily life and sports performance. The design philosophy fuses function with attitude. Available in two different variations - Tortoise Shell Frame with Green Polarised Lens or Matt Tortoise Shell Frame with Brown Polarised Lens - see the spec for each below. 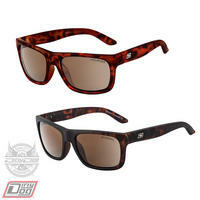 Lens Colour - Brown Polarised - Superior visual definition. Increase contrast, enhance fround level contours in most light conditions.